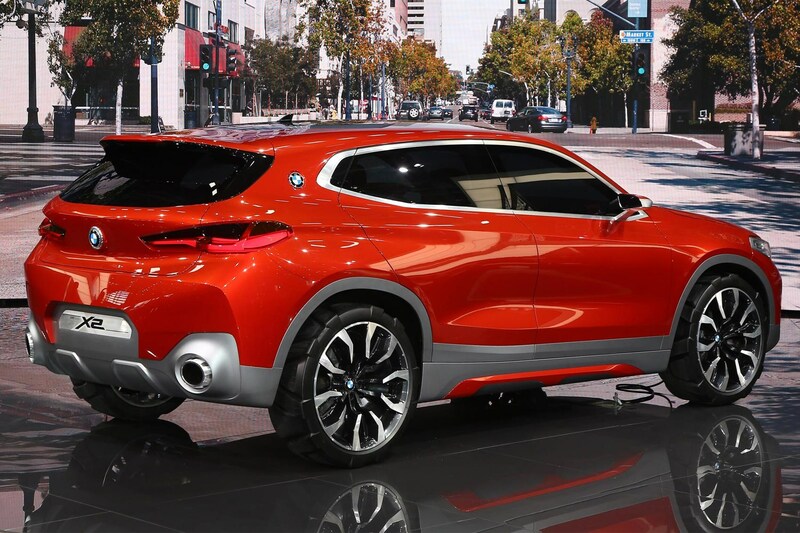 Home Car News Motor Shows & Events Paris 2016 New BMW Concept X2: they've gone and shrunk the X6 again! Wanted proof that the crossover craze is showing no signs of abating? Here's the new BMW Concept X2, an even-numbered, low-roofed SUV bringing the slammed X6/X4 vibe to a smaller, more affordable package. It's the big news from BMW at the 2016 Paris motor show, which kicked off in earnest on 29 September. On the grand scale of concept cars, the X2 looks very close to production for us. Sure, strip away the 21-inch alloy wheels and pop some conventional door mirrors on, but the overall volumes are said to be close to what you can expect in showrooms by late 2017. We've already scooped the production car; see our spy photos here. Note the difference in volumes of the headlamps and grille; lights are getting ever-slimmer, shrunk by LED and laser technology, while designers seem hellbent on making air apertures even bigger, with the deepest twin-kidneys we've seen in ages on a small Beemer. There's plenty of 'shark-nose' wedge at the front end and BMW has crafted just enough slammed, low-roof coupe-alike athleticism to warrant the even-number badge, highlighting the sportier crossover billing. BMW now reserves the even numbers for sportier SUVs (X4 and X6); the more family-focused, upright crossovers use odd digits (X1, X3, X5). Silver faux-off-roader plastic cladding may not appeal to BM fans, but we reckon some of the detailing is neat, especially the BMW roundel on the C-pillar, referencing the legendary M1 supercar from the 1970s. No technical details have been issued about the X2; this is strictly a design study, not a working technical showcase. However, it doesn't take a super-sleuth to work out that this new model will be based on the hardware you'll find under any of BMW's small cars; expect transverse engines and front- or four-wheel drive to feature in production, as Munich switches its junior ranges to the same FWD architecture you'll find on the latest Mini.